The famous Antwerp Hands are a traditional gift and an official Antwerp quality product. 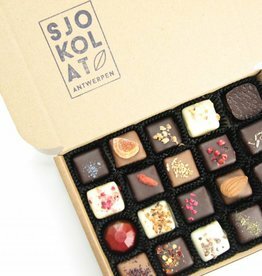 This small luxury box contains 12 hands made from artisan chocolate. 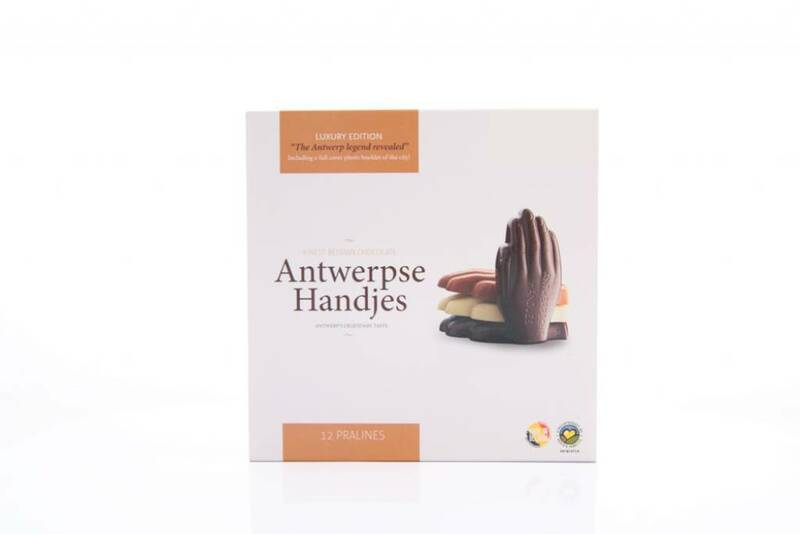 The milk and dark chocolate hands (4 pieces each) are filled with a delicious almond marzipan and a hint of Elixir d' Anvers, a traditional liquor from Antwerp. 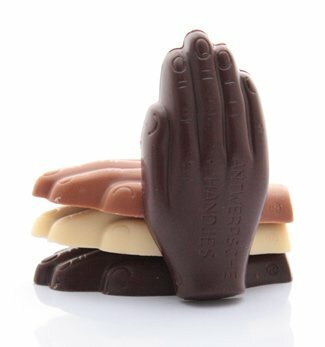 The white chocolate hands (4 pieces) are filled with a creamy hazelnut praline. The box also contains a luxury full colour booklet with a short explanation of the story behind the Antwerp Hands. The name "Antwerpen" is supposed to have come from the words "hand werpen" ("to throw a hand" in Dutch). According to legend a giant called Druon Antigoon charged every passing ship in the river Schelde a high toll. Those who refused to pay got their hand cut off by the giant. A Roman soldier called Silvius Brabo slayed the giant, cut a hand off the enormous corpse and threw the hand into the river Schelde (throwing a hand - hand werpen - Antwerpen). Nowadays Antwerp Hands are a sign of friendship, and therefore they make the perfect gift in a (business) relationship. The Antwerp Hands are a traditional gift and an official Antwerp quality product. This luxury biscuit tin contains ca. 40 hand shaped butter-almond biscuits. Antwerp Hands are a traditional gift and an official Antwerp quality product. This luxury box contains 48 plain chocolate hands in white, dark and milk chocolate.